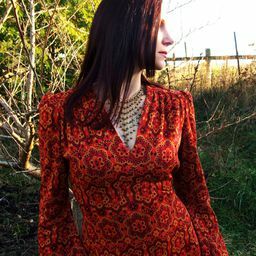 A fabulous mourning shot taken while photographing this dress for sale in my Etsy shop. My model has a very heart-shaped face, which was accentuated by the 3/4's angle with which she is holding it to the camera. So even though I chose some of the more high fashion shots to sell the dress, I thought this one had wandered into the region of a captured-moment-in-time type of shot. It really looks like a caught a beautiful woman in mourning! Date Uploaded: May 23, 2015, 5:25 a.m.